This is my last week of shopping with $60 for the unforeseeable future. For those of you that missed it, John lost his job last week and now we’re down to zero income for awhile. 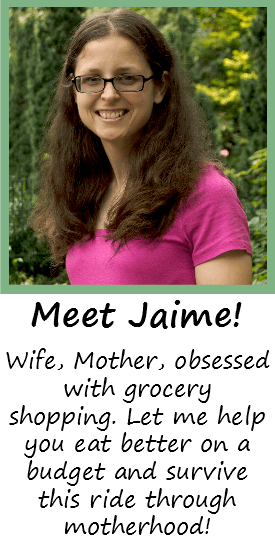 We’re doing fine as far as bills and stuff go, but I want to cut back on the grocery budget for awhile to make our money stretch as long as possible. 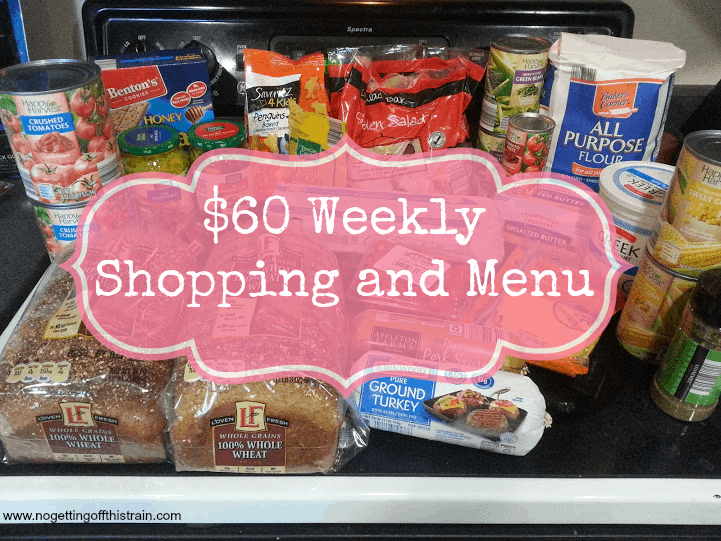 Starting next week, I’m going to attempt to buy groceries for the 3 of us for $30 each week; this is pretty much only made possible by the fact that my pantry and freezer are pretty well-stocked, and the $30 will cover the necessities and fresh produce, and if there’s any money left after that it’ll go toward attempting to fill the freezer/pantry again. I’m thinking of this as a fun challenge, so let’s see how it goes! This week was just amazing. 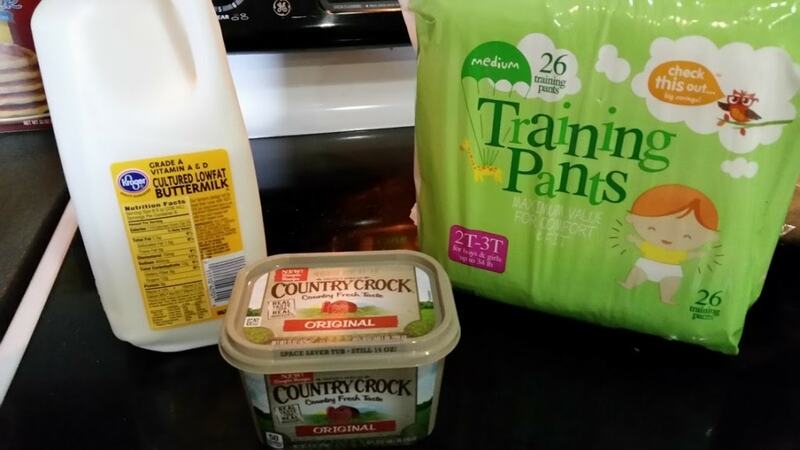 I had a plan, which included buying laundry soap from Menard’s for $5.00, and according to my calculations, I was going to have a little bit of money left over after everything. 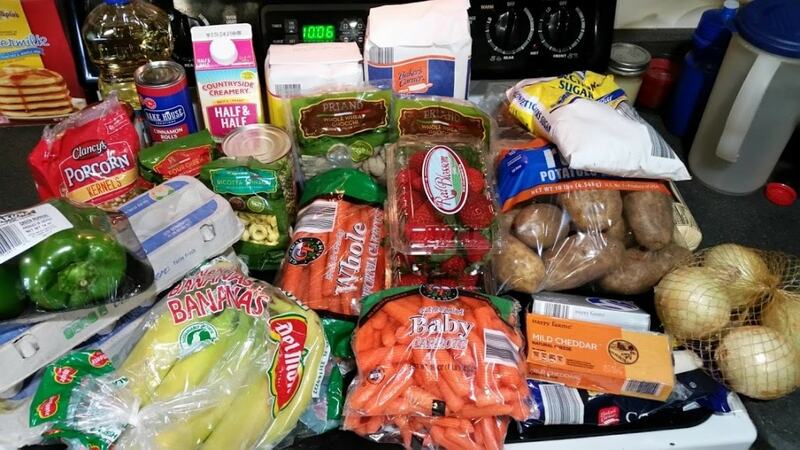 Aldi was kind of a goldmine; we always look at their clearance aisle, and there was a lot of great stuff, like gnocchi for $.99, popcorn for $.99… I remember just putting item after item in my cart and thinking, Okay, I’ll probably be right on budget this week, then. We went to Kroger after Aldi and then calculated everything, and before the laundry soap, I had 19 dollars left in the budget. 19 dollars. I have NO idea how that worked out, except that God takes care of His children when they need it most. Anyway, take a look at everything I bought this week! 2 jugs Sun laundry detergent: $4.95 each. I decided to start buying detergent because I realized if it was on sale, it was a lot cheaper than making my own. 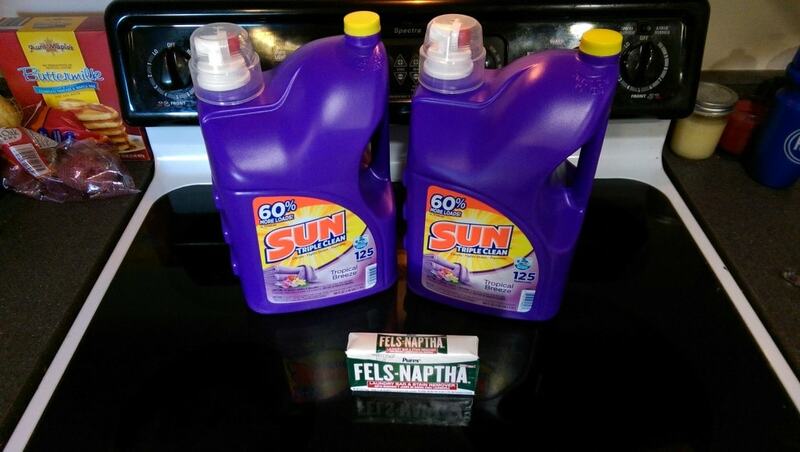 Fels Naptha soap: $.99. We’re using this to make the last batch of laundry detergent using the leftover stuff we have. I’d say we’re good on detergent for awhile! This is all subject to change because we got a lot of leftover food from Easter, including tons of deli ham from my parents. You’ll probably see a few of these dinners pushed to next week! I also made an amazing carrot cake for Easter with some of the ingredients I bought above! What’s for dinner this week? Share with us in the comments!